The world has lost some absolute greats from the realm of horror in recent times, and one of the ones that stings the most is the loss of Tobe Hooper, whose 1974 debut feature The Texas Chain Saw Massacre impacted cinema like few others. But Hooper's legacy is perhaps not as clear as we think, as the director has rarely been mentioned in his other role as composer. But it was Hooper and sound expert Wayne Bell that gave Chain Saw its musical bite with a nightmarish soundscape and and a legacy that still reverberates in the genre today, something Austin native Bell is happy to discuss. "In reading on Tobe's death," Bell says, "there's a lot of talk about how the cinematography creates this aura or this environment and I look at those scenes and I'm saying, you know, I think the thing that's really creating the evironment is what's going on acoustically from our score. As much as it is what is being seen, a different sound under those same images and those images might not have as much portent or as much dread in them as these reviewers were thinking was assigned to the visual, the soundtrack was doing the foreboding, you know, the anticipation of trouble." The Texas Chain Saw Massacre is a film that intentionally bypasses the passive and voyeuristic nature of horror films and instead goes for the audience themselves. Much of the unrelenting doom that traps the viewer is created through sound and particularly score, although one of the ways Chain Saw unsettles is from the blending of that line between what is sound and what is music. "Both Tobe and I loved that boundary between music and sound. That wonderful mushy grey area between "is it music?" or "is it just sound?" is an area we loved playing in, and it's an important component of what we were doing, so there becomes some indistinction, and that you the audience don't know is just fine." The impact of the score was like nothing ever before, and Bell talks about the early days and any relation to the aural world of musique concrète. "You know, only slightly." Bell opines. "That's an important association, musique concrète, and here's the ways they're similar: what we did and what these French abstract guys were doing - first it is abstract and it also once again plies the waters between what is music and what is sound. But another important similarity between us and musique concrète is the use of editing as a composing tool. One of Tobe's great strengths was as an editor and I came from an editing background as well, so it was just a real natural fit, the idea that we would create a body of work and then compose it by editing other than performing it that way. We did several sessions and performed various things that would sound right and essentially what we did was create a library of things, of performances. Not actually scoring to picture but more like, "this is strictly tension" or "this is the bone room" or "this is chase". Perhaps the most musical cue in the film is also the most apocalyptic, where the first appearance of Leatherface from his little room is closed off with a horrifyingly foreboding sting scoring the slamming of the door. We've just seen him emerge from the room to brutally attack Kirk with a hammer before pulling him aside, and the sting is a wake-up call to the audience to ask them to process what they've just seen, as well as think about what else may be coming. What does come is Pam, looking for Kirk, and as she makes her way into the family's bone room the insanity is turned up. We're as overwhelmed as Pam as we're trapped in a room full of furniture made from human skeletons, all kinds of animal carcasses, and the infamous chicken in a bird cage, and Hooper and Bell are scoring two things here: our reaction and Pam's, with rattling bones and metal shaking and rhythmic grinding that feels like the synapses firing all at once. Our brain is trying to process the information given to us, but that information is at the ultimate end of depravity, the likes of we've never seen before. Amazingly, that sense is heightened even more with the dinner sequence, and this is where everything blends into one. As Sally is tortured physically and mentally by the family, we are privy to watching her descend into madness but also included in the attack, with high pitched strings and mechanical tones interspersing with her screaming and the animalistic sounds coming from the family. It's a devolution; this is pure primal terror and Hooper knows how to drive the audience insane with those massive close-ups of Marilyn Burns' eyes along with the score and the sound, all of them phasing into each other and birthing a soundscape of unremitting terror. And of course there is the flash, that squealing sound we hear when the camera flashes during the film's prologue. It's the iconic sound of the film, something Bell recognises, but he's still very protective of his methods regarding the sound. "Well, that is the signature chainsaw sound, like when one thinks sonically of The Texas Chain Saw Massacre, the signature sound is that stinger that I created. I told Tobe how I recorded it and how I made it and I've seen in subsequent interviews when they asked him about it, I've seen that he doesn't remember accurately how I actually did it. His point was that a lot of that sound you just can't make now, but in truth I could perform that sound right now. Gunnar Hansen who played Leatherface was a friend of mine so when he decided to write his book about the making of Chain Saw he came to see me to record me for the book, and once he was done recording I said "Okay Gunnar, stand here, close your eyes and listen to this." And I got the wonderful pleasure of performing that for him and watching him just electrify when he reheard that sound, heard it live. So it is a sound that I can still perform, and the method of making it I'm just going to hold to my chest rather than talk about it. And the reasoning behind that is, ultimately anybody could figure out how it was done and repeat it, but I think it would be a kindness, certainly a respect, for what we did and the effectiveness of it, to leave that sound with Chain Saw, a tip of the hat and not applying it to this and that other use. I certainly have no control over that but it would be kind of nice to leave that sound in our collective cultural memory as the centuries go on, that sound belongs to Chain Saw." And amidst all of this is the eponymous chainsaw itself, whose vicious roar cuts through all other sounds whenever it is used (Bell himself says "I have miles and miles of it"). It's Leatherface's voice, his instrument, and the one way he can truly express himself, and by the end of the film it has transposed to being truly musical. 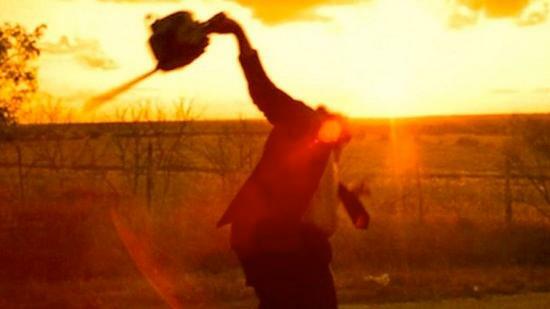 The unforgettable climactic scene of Leatherface wielding the chainsaw against the hot Texas sun, his baton perhaps leading a symphony of bloodlust but more likely the angry guitar solo of a teenager, all the frustration and anger of losing his quarry but also his fury against a world that cannot understand him and would not want to. It's not difficult to see where Hooper and Bell's work has influenced others, especially now. One only has to look at contemporary composers such as Joseph Bishara and his work on films like The Conjuring and Insidious, or even Trent Reznor's acclaimed film work (and certainly his music with Nine Inch Nails), as well as the arguments that have broken out over "score versus sound design". Bell himself cites Nicolas Winding Refn and Peter Strickland as two directors who are influenced by the film's score, especially in the latter's 2012 horror Berberian Sound Studio. Despite the nature of the film itself, Bell has fond memories of the production. "The people and the fun of the doing of it, and the relationships that are built. When I think of Chain Saw I think of people as much as the art itself." Bell's welcoming nature as well as his skill with audio has seen him working with Richard Linklater since the 1990's, with him just finishing work on the forthcoming Last Flag Flying, a film he says he thinks is the director's best work. But the pure and efficient terror of The Texas Chain Saw Massacre still stands on its own, one of the major experimental works of cinema and one of the scariest film scores of all time. "We're pretty darn proud of it."